Source current cannot damage the load, the only safety need is Overload protection, for example you are not using VFD but a DOL starter the basic type to run your motor, the only protection it have is Thermal Overload protection, that you select as per your motor max current so that in event of stall or mechanical overload the TOL shall trip. You may have a 1000KVA transformer in your factory and using 1KW motor as load it doesn't mean that high power source will damage small loads. 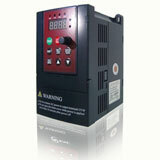 If you are running a light conveyor with say small boxes on it, the VFD should meet the current rating of the motor. On the other hand if you are running at the steel and iron plant (=hot) with lots of stop and goes you may look contrary. I would consider the load and the environment as an important criteria. Check the output of the VFD at 40 and 50 degrees. Compare it with the application you have. 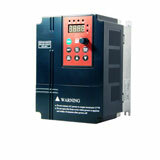 Most of the VFD products do have over load protection. In order to take the further step, use fast acting fuses. They will protect the power electronics safely. If your VFD has a voltage input, you can connect a PTC thermistor to the motor, and its output between the voltage input and GND. A bias resistor R1 is needed between V input and +Vcc (usually 10 Vcc). The value of R1 is 1 - 20 Kohms depending on PTC and Vcc. In this way you can set parameters related with the V input together with alarm values, or even a relay output if available in your model. Modern PWM frequency drive was first developed in Stromberg Finland early 1960s. First commercial break through was Helsinki metro at 1972. This development was lead by Martti Harmoinen. They also developed first commercial cyclo converter in 80s and many other pioneering innovations.